I picked up a few travel tips on my recent trip to Mexico! Read on to find out what I learned. If you read the story in my pico de gallo post, then you already know that my trip to Mexico this year did not go well. The experience we had at the airport, and at the Vidanta Nuevo Vallarta resort, really messed up our week. Despite all of the drama, we did manage to enjoy a few moments here and there. 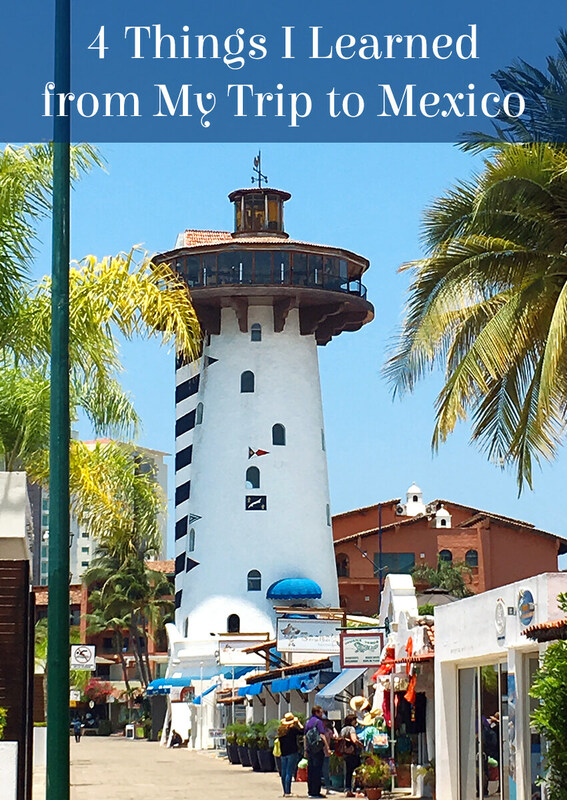 One of which was our unplanned day trip to Marina Vallarta. 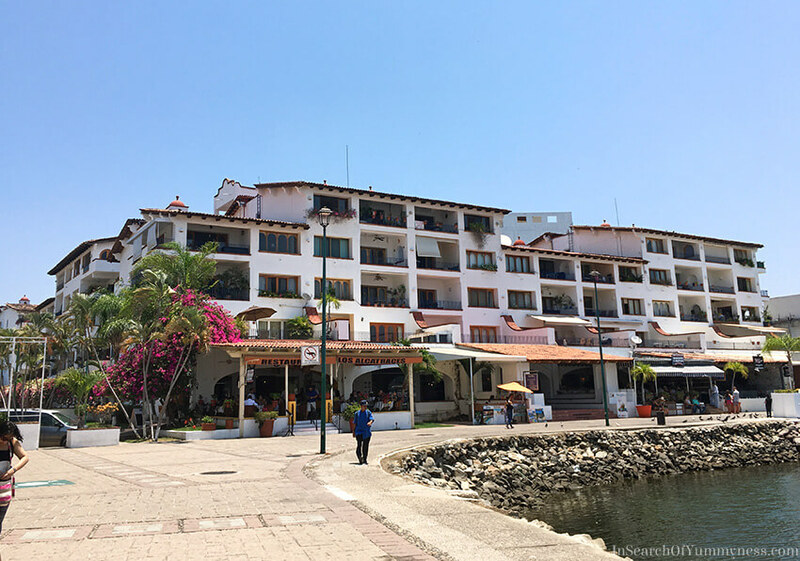 This was my family’s first trip to Mexico, and we had planned to visit the downtown area of Puerto Vallarta. Sunday was our first full day at the resort, and we wanted to do some sightseeing and grab groceries for the rest of the week. The Vidanta resort has a grocery on location, but it’s expensive and has a limited section. Plus, my friend Janice (who goes to Mexico every year) recommended supporting local vendors in the area. On Sunday morning we asked our concierge what the best way to get to the downtown area would be, and he recommended that we take a taxi. As we headed to the resort’s taxi stand, we noticed that it was incredibly busy – but didn’t think much of it. After waiting for close to an hour, one of the resort workers told us that a cab was finally available. He asked us where we wanted to go, and explained our destination to the cab driver in Spanish. We had no idea what they were saying, but we could tell from the driver’s tone of voice and body language that he was irritated. Reluctantly, he eventually agreed to let us into the vehicle. As he drove out of the resort, he explained that there was an election happening in the area, and as a result the traffic was horrible. The usually 20-minute drive from the downtown core to Vidanta Nuevo Vallarta’s main entrance had taken him over an hour. Travel Tip #1: Always research what’s happening in the area you are travelling to. Maybe there will be a festival you can check out, or a political event that you’ll want to avoid. Either way, don’t rely on others to inform you. We asked the driver if there was anywhere else we could go to get groceries, and he suggested a Walmart that was nearby. It wasn’t our first choice, but considering the situation we figured it was our best bet. As we headed towards Walmart, we could see the back-to-back traffic headed in the other direction. Nothing was moving. It made me wonder why the concierge hadn’t thought to tell us that traffic might be bad that day. He was replaced with another (much friendly and more helpful) concierge the next day though. I wasn’t surprised. When we told him that this was our first trip to Mexico, he tried to talk us into a “private” tour of Mexico with one of his “friends,” which we obviously declined. So sketchy. Since we knew we wouldn’t get to see much that day, we agreed and exited the vehicle. 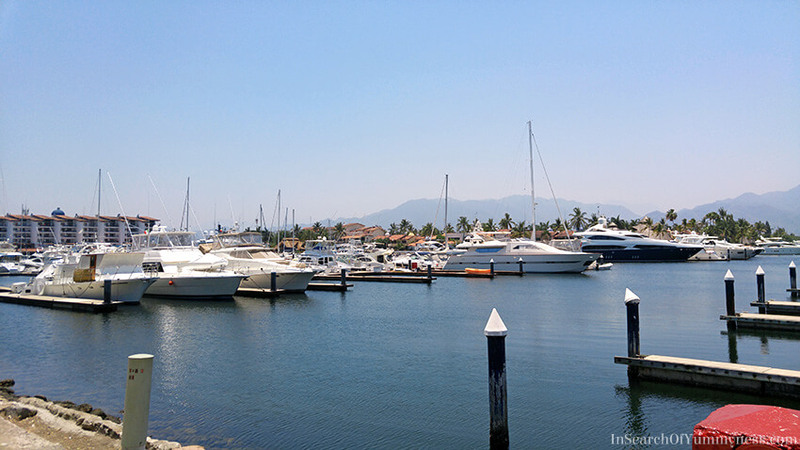 Marina Vallarta is, as we discovered later, a planned community with vacation clubs, a golf course, condos, a shopping/restaurant area and, of course, a marina. If you’re looking for an authentic Mexican experience, where you can see where the locals go, this is not it. Neither is Nuevo Vallarata. These are 100% tourist areas, which while nice, are totally manufactured (and the prices reflect that). We walked along the boardwalk, checking out the clothing and knickknack shops along the way. I ended up buying a big floppy hat to help keep the sun off of my face. Travel Tip #2: Walking outside in the midday sun, especially in a hot country, is a terrible idea. We already knew to avoid being out midday, but things just didn’t work out in our favour. Thankfully we all had slathered on sunscreen before we left, so no one got burned, but it was a very hot walk. Can you spot me in this photo? After checking out the various dining options in the marina, we decided that we wanted to eat Mexican food (when in Rome, right?). We chose a restaurant called Los Alcatraces, and had the best meal we’d eat all week. Honestly, I don’t know how “authentic” the food was at this restaurant was, but I can tell you that it was delicious! The night before, we had a “Spanish” themed dinner at the resort, and ate the most bland paella I’ve ever had. It was so flavourless, it didn’t even make sense. How can a dish with so many ingredients be so devoid of taste?! Anyhow, there was a Mexican couple sitting at our table, and they explained that the resort food was about as inauthentic as you can get. Which makes sense, because they probably want to make sure that people from all backgrounds can eat it, so they won’t make anything super hot or too strongly flavoured. It was a shame though, because the paella looked really good. 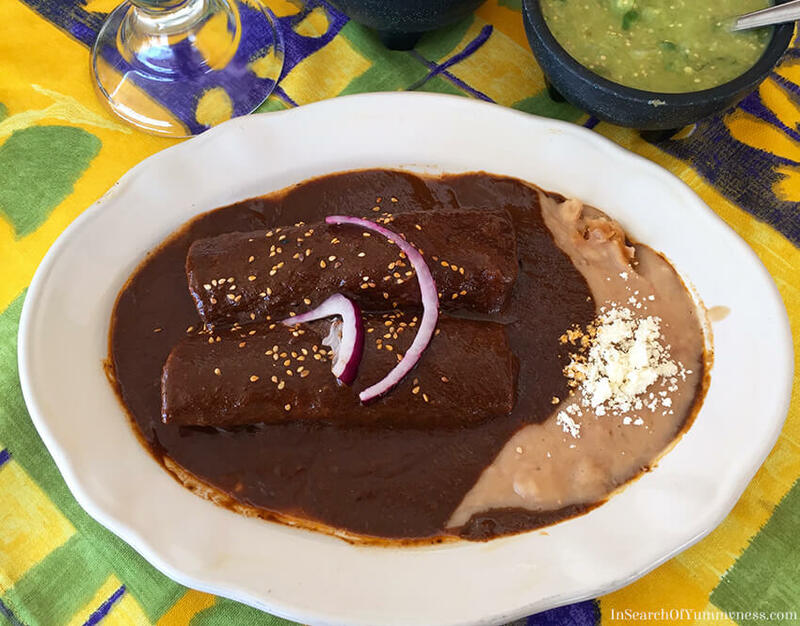 That conversation stuck with me through lunch the next day, and as I devoured my enmoladas with chicken (basically an enchilada with chicken and mole sauce), I decided that I didn’t care if the food was “authentic.” It was tasty, and obviously made with a lot of care. I wish I could describe what it tasted like, but that mole sauce was so complex… like mild chilis, and earth and cocoa. Which sounds so weird, but it was good, I swear. My parents and brother enjoyed their food as well, and later agreed that it really was the best overall meal we had in Mexico. The place was pretty clean, the ambience was nice (we ate on the patio) and the service was friendly. You can’t ask for much more than that! We did eat at several of the restaurants on the (massive!) resort over the week, but most of them fell flat. The Asian-inspired restaurant, unfortunately named Gong, had the worst food that we ate. Meanwhile, their Caribbean restaurant (Havana Moon) was pretty decent, and their “modern” Mexican restaurant (Epazote) was excellent. One of the waiters let me film him making a classic show-stopping drink called Cafe Flameado (literally, flaming coffee! ), which you can check out below. But as much I loved the “elevated” food at Epazote, its the flavours of the comfort food at Los Alcatraces that have stuck with me. Somehow, it’s always the simple, tasty food that is the most memorable. We hadn’t planned on going to the marina, but if we hadn’t we would have missed out on some seriously delicious food! We had a nice walk, and took some pretty photos too. At least when I look back at the pictures from this trip, they aren’t all from the resort! Travel Tip #4: Be open to change and you might find something great. The day was long and exhausting, but the marina was definitely a highlight. If you’re wondering, we did make it to Walmart eventually, although we attempted to walk there until we realized that a) there are no sidewalks in that area, and b) the driver meant “5 minutes up the road” by car. When we did get there, I found cinnamon flavoured Frosted Flakes (Zucaritas!) which pretty much made my day. I also bought a really cute purse in the department store next door, and made the transaction without speaking any English! So while our first trip to Mexico wasn’t as great as we had hoped, we did have some pretty great moments, and I learned a few things. Do you have any handy travel tips to share? Let me know in the comments! That’s a drag! I have been going to Mexico for 30 years but I stick to the Yucatan/ Quintana Roo. We have stayed at all inclusive the last few times but we just use it as a hotel with free breakfast and poolside drinks and snacks. We always rent a Jeep at the airport and skip the bus that comes with your package. Pretty much every day, we hop in the Jeep after breakfast and go off to explore. It’s a lovely area with lots to do so and see and it’s more fun and way cheaper that paying for resort sanctioned excursions. We eat where the locals eat and try to avoid the resort restaurants, for the most part. I do a ton of research and make sure we pick a resort that has decent food – all inclusives are not knot known for that and if you are really into food , you aren’t going to be thrilled with most of what they offer until you are paying top $$$ at a place like the Myakoba resorts. Thanks for the tips Carole! It’s nice to know which areas people enjoy visiting. 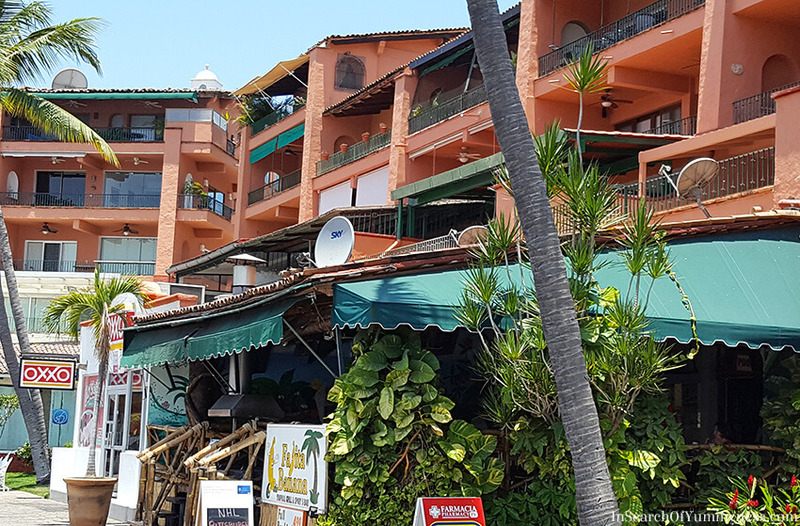 This resort actually wasn’t all inclusive – we ended up there through a timeshare swap. I definitely wouldn’t stay in the same place again. We had a good stay in Jamaica last year, but this one didn’t work out so well. Great tips! Especially like the 4th point.. isn’t the whole point of travel to be in moment and embrace things the way the are.. I have learnt that trying too hard to stick to a fixed agenda and schedule can be rather disastrous.. lol! Thanks! I agree, sometimes trying to be too ridged just doesn’t make sense. I tend to overplan, so I need to learn to not schedule every moment. Awesome tips! I’m glad you were all safe in the end despite everything !